In early 2012, a brief was prepared by the City of Sydney for the review and update of the existing 2005 Register of Significant Trees. It was stated in the brief that: “Significant trees are often the last indicators of former natural and cultural landscapes and provide a valuable heritage resource on many levels. The community correctly places high importance on the recognition and protection of significant trees”. The purpose of the Register of Significant Trees is: “To identify and recognise the importance of significant trees in the landscape, to guide their management and to ensure their protection for future generations”. The register forms part of a suite of documents under the City’s Tree Management Policies. 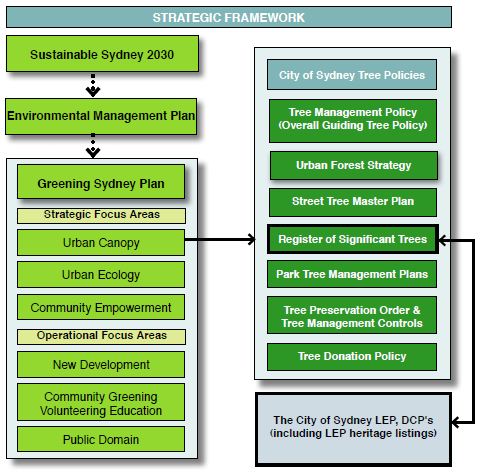 These documents provide the tools for tree management and planning in the City of Sydney. ensure thorough consultation with all key stakeholders. This website summarises key information from the print copy of the register.If you would like to review the Register in the print format, you can download the documents from the City’s website here. The Register of Significant Trees is informed largely by the Greening Sydney Plan and the City’s Urban Forest Strategy. This strategy will influence the register with regard to impacts and opportunities for significant tree protection, and improved communications and promotion of this valuable resource. In turn, the register both informs and responds to the statutory planning instruments such as the City of Sydney LEP 2012 and the related Development Control Plans and Heritage Listings. The diagram below graphically explains the relationship of the key planning documents and where the Register of Significant trees sits within the wider suite of City documents and planning instruments. If you would like any further information about register please contact the City on 9265 9333 or at treepolicies@cityofsydney.nsw.gov.au. This section provides a list of suburbs which contain locations that have been assessed and considered as significant. To find a tree or area of interest, refer to the map on the following page for the locations within various precincts.